And I mean anything. Trust me. Whatever new technology comes along someone will use it, or combine it with something else, to create something unique. And this is true of 3D Printing. The technology has been around for a while, used by designers and engineers to create prototypes and demonstrations for shows, and has now matured to the point where desktop and portable devices are soon to be available although some, like the Kickstarter-funded Formlab Form1 have come up against patent issues that are ongoing. The idea, of slowly producing three-dimensional solid objects layer by layer by laying down material one layer on the next or selectively laser-fusing or curing liquids to form the layers, at the moment produces solid parts that can be assembled like an Airfix model kit but there has also been an intriguing chocolate 3D printer which could prove popular too. Already there are online archives of things to download and print from models of the Eiffel Tower to AK-47s – as I said, someone will always find a use for such tech. 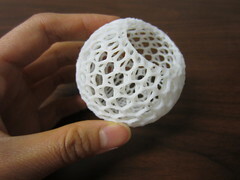 The hope is that in future the technology could combine multiple materials in a single object, extending the technique beyond plastics and further improving the detail achievable although at the moment the printers can create tiny details, and even using the materials to replace structures like steel beams. One amazing use is a device called a 3D Bio-Printer that can print out a hybrid natural-synthetic cartilage which once implanted acts as a support for natural tissue to regrow. Which medical miracles brings us to two Japanese uses for the technology: firstly a 3D photobooth that can scan your body and create a plastic mini-me, perfect for those who are so into model railways they want to be in their model railways, and secondly Fortean Times this month (FT297 pp10) reports on a clinic in Tokyo that uses a “Bio Texture” process and MRI scans to give parents-to-be a chance to see and hold their baby months before birth. The “Shape of an Angel” service is £800 plus the cost of the MRI scan. Imagine the scene, a family get-together, the baby photos are brought up on the wall projection to embarrass the teenager as parents sometimes do… “This is you when you were five… ah, when you were two… look, you were only a few hours old there… go get the box… this was you when you were minus three months”.